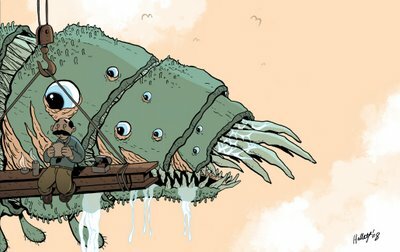 Scott Hallett | Sketchbook: Giant Monster! This is for the topic "Giant Monsters" over at Drawer Geeks. Probably the first time I've slammed together colors without looking back and nitpicking. Not that I'm saying it's perfect, but it was a good experiment. Done with brush pen, pen and colored in Photoshop, in about an hour or so.